This kimono! OMG. Loving it. I told my husband it looks like 70’s upholstery. He said, “yes … you say that like it’s a good thing.” Ha … It’s a fabulous thing! So fun! Several women asked me where I got it. I guess I’m not the only one who likes putting some groovy into her wardrobe! Of course, leave it to my little boho heart so go all the way and add fringe hem jeans, a fringe bag, and even platform clogs. When I went into my local Starbucks (my “Cheers” … everyone knows my name), the gang said I looked like a rock star. Made my day! These fabulous fringe hem jeans are sold out. I know, I know… but I warned you, didn’t I? I knew they were too good of a deal and wouldn’t last long. I did link up some others though. I’m also wearing my Kendra Scott emerald cat’s eye earrings, and I stacked a Lucky Brand turquoise bracelet with my special Chico’s girlfriend bracelet. How else can I style it? This kimono would also look chic with some black pants, wouldn’t it? Flares or bootcut, cropped, cropped flares! And I think it would look sensational with the right belt. The kimono is even long enough for many of you to wear it as a dress. Though I would suggest something simple underneath for coverage (or add some snaps)! Those of you who follow me on Instagram and saw my Insta-story yesterday know that this photo shoot had some issues. Platform clogs and tall grass don’t really mix and I ended up face down with grass-stained knees as well as a damp camera. So glamorous! But I’m fine, my camera is fine, and hopefully after a good wash, my jeans will be fine too. You have to laugh at what bloggers are willing to do for a good shot! Ironically, I didn’t use one photo from after the fall. In all those shots, I looked embarrassed or scared! Have a wonderful start to your week … and to you month! Well, I’m glad you’re okay Dawn—because cameras can be replaced and so can jeans—but knees & bodies are a little harder…LOL! I never really thought of myself as a boho girl, but I think little by little I’m being pulled into it because I love the kimonos!! 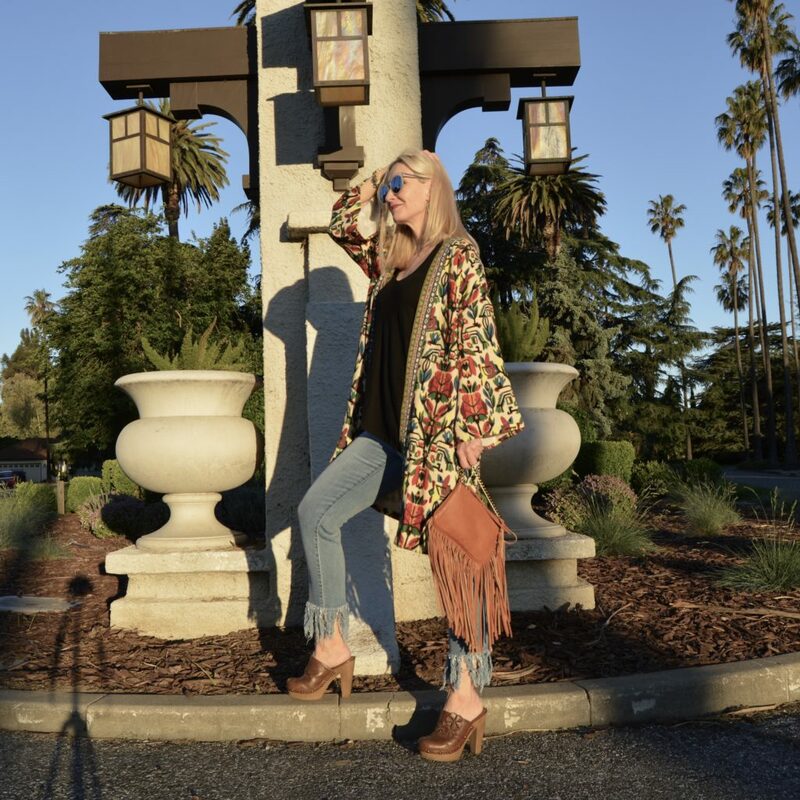 I am so in love with Boho and this kimono is spot on fabulous! I would love a pair of fringe hem jeans but it’s already so hot here in Orlando I don’t think I’ll wear them enough. Moving to a cooler climate more conducive to my fashion tastes sounds like a plan right about now, lol! Um, yes, this kimono is supremely fabulous! And I would totally fall head right over heels into the grass to have one! But alas, it appears to only be available on S, M, L and these linebacker shoulders of mine need at least an XXL! But if I spot one similar, you better believe it will end up in my closet! It really is gorgeous and you most definitely are rocking it like a rock star, Dawn Lucy! Oh dear! I am happy you are ok! Good you can have fun with it all! This kimono is so fabulous, and you are right, it goes with so much. My inner boho is wagging its tail! It would even be a fun swimsuit cover up! Haha … “my inner boho is wagging its tail” … I’m totally stealing that!! 😀 OXOX! You look fabulous in that kimono, and I love the boho style. Have a fun new week. Yeah, this outfit definitely reminds me hippies style. Hope you had a wonderful weekend apart from the fall! Oh my! I ‘m glad everything is okay! 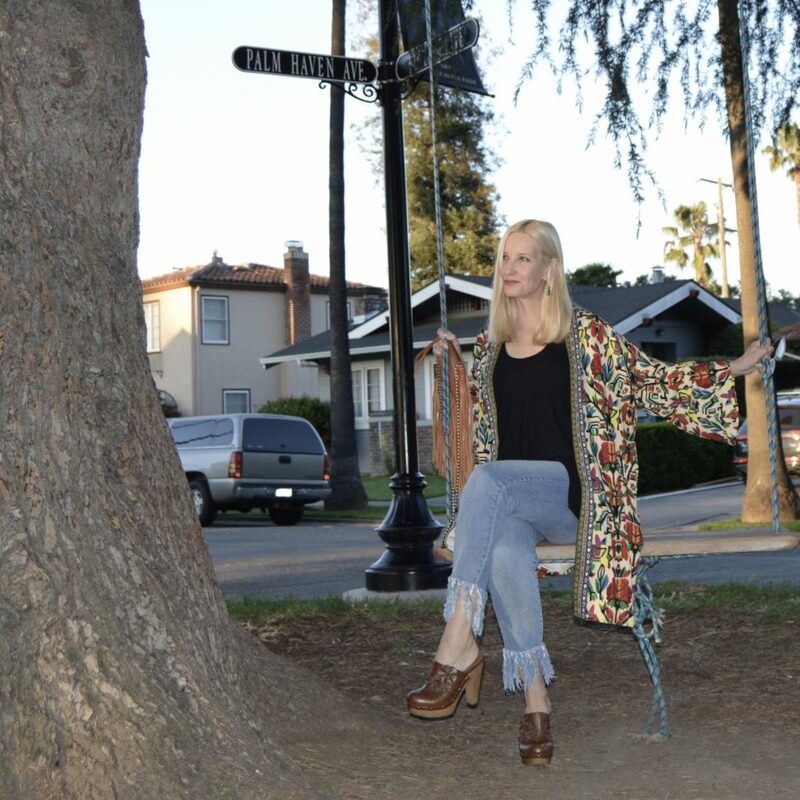 I love the way you styled the kimono, It’s perfect with that jeans! Thanks for linking up to our Ageless Style Linkup party. I think it is a good thing. I like your coat and I am looking for a tailored fit-and-flare coat in that material. LOL. What we do in the name of blogging huh? I am glad you are ok!! That jacket is so cool, love the print and the whole look is so fun and hip my friend! Thanks for linking up to Top of the World Style. I adore this coat! you look awesome in it! I just ordered this kimono, thanks to your gorgeous outfit!